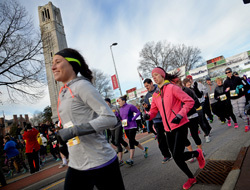 The Krispy Kreme Challenge begins and ends at NC State’s memorial belltower. The Krispy Kreme Challenge, a beloved NC State tradition initiated by Park Scholars, draws thousands of participants annually from all over the nation (and even the world). Since its inception, the race has raised more than half of its $2 million commitment to the UNC Children’s Hospital. Celebrate the 13th annual Krispy Kreme Challenge at an informal open house on the eve of the race. Mingle with Park Scholars, alumni, families, and friends, and see the Park Scholarships’ newly renovated Commons in Peele Hall! The Park Scholarships program will provide hors d’oeuvres and refreshments. If you are able to attend, RSVP here by Sunday, January 29. 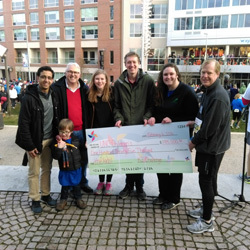 NC State Chancellor Randy Woodson (second from left) joined the 2016 Krispy Kreme Challenge co-directors in presenting their $195,000 donation to UNC Children’s patient David Cumbie and Hunter Burnette, Chair, UNC Children’s Board of Visitors (right). Take the challenge—2400 calories, 12 doughnuts, 5 miles, 1 hour—and support a great cause. Get the details and register for the race here. Save the date to join us for the 1st annual Krispy Kreme Challenge benefit reception at City Club Raleigh on the evening of Saturday, February 25, 2017. All proceeds will benefit the UNC Children’s Hospital. This event will include opportunities to hear from UNC Children’s Hospital families and student race directors, meet other valued friends of the organization, and participate in a silent auction. Tickets are $100 per person. Stay tuned for more information. For questions or sponsorship opportunities, contact Molly Mueller ‘19 at molly.mueller@krispykremechallenge.com or 980-233-1208.